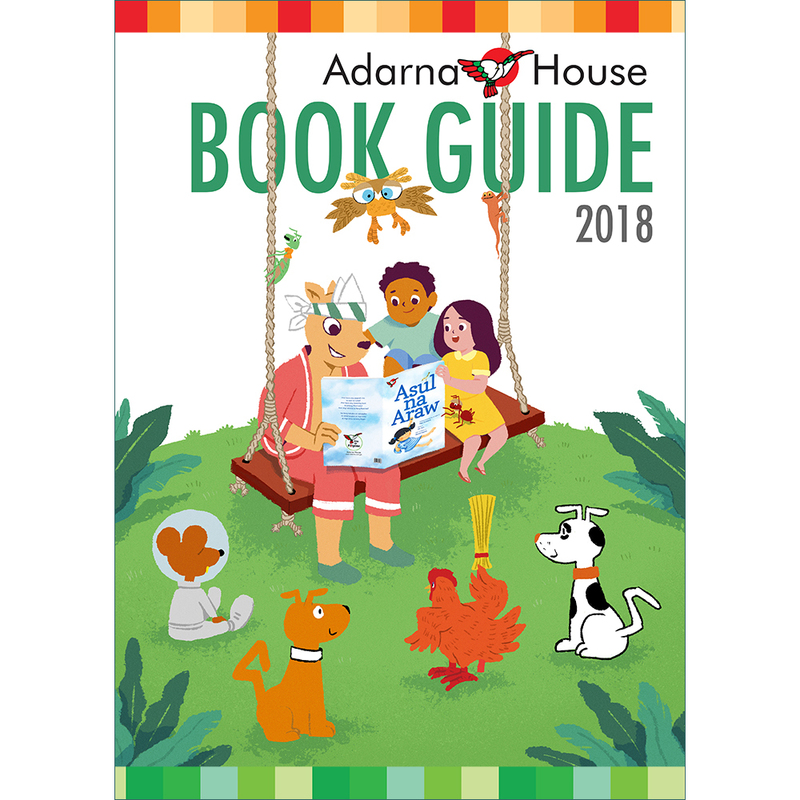 Adarna House, the first and one of the largest publishers of children’s books in the Philippines, is now accepting applications to the 2019 Barláya Writers’ Workshop for Intermediate and Young Adult Literature. BARLÁYA is a comprehensive workshop for crafting and developing books of intermediate and young adult writers in the Philippines. The workshop is open to any Filipino citizen aged 18 years or older, and willing to attend monthly learning and writing sessions in Metro Manila. Accepted fellows are expected to attend ALL the sessions which will last from April to September 2019. Submissions must be in hard copy, 1.5 space, Times New Roman 12 with 1-inch margins on short bond paper. Submissions may be in either English or Filipino. Deadline of submission is on March 22, 2019. For further queries, you may call e-mail jonnel[at]adarna.com.ph. Summer reads for your kids! Summer is here! Kids have a bunch of time to read and we’ve got you covered! They will surely enjoy the long vacation as Adarna House introduces its latest bundle of storybooks perfect for summer reading! The Adarna House Storybook Boxes are specially curated to teach basic concepts and self-care using bilingual books. Each story box contains 5 storybooks. The Basic Concept box set teaches counting, animals, proper and common nouns, daily routine, concept of left and right, and perseverance. A story of a boy who encounters various animals in his house, this book teaches children about counting and animals. But That Won’t Wake me Up! But That Won’t Wake me Up! is a book on the many ways one can wake up early in time for school. Early readers learn about days of the week as they accompany Peles, a lazy grasshopper, who decides to plant tomatoes and to wait each day for his seeds to grow into red plump tomatoes! Do the right slipper and the left slipper really get along? Find out in this amusing children’s story, created to be read alternately. A girl enjoys the different activities each month brings, but deep in her heart, she wonders about one thing: how long till September? This book teaches counting and teaches the months of a year. While the first set teaches the basic concepts to kids, this box set teaches Self-care. These storybooks teach the importance of proper hygiene, eating healthy foods, virtue, and gaining self-confidence. The good carabao is a good role model. He always does good things. He gets along with his fellow carabaos. He has a love for truth, kindness, and beauty. It is fun to count the things on each page, from 1 to 13. What happens to a little boy who only eats junk? I Don’t Like to Eat is a story about the consequences of eating unhealthy food. Just Add Dirt teaches proper hygiene alongside teaching children different kinds of vegetables. The book Alamat ng Ampalaya invites children to give the bitter vegetable a chance while sharing important lessons such as being fair and grateful for what one has. Grab these boxes this summer and have your kids reading! The Adarna House Storybook Boxes are available exclusively at Fully Booked branches for PHP450 each. We know you’d be really sad to hear that we’ll be increasing our prices by June 1, with our storybooks at Php 73.00 and our big books at Php 275.00. This is the first time we’re increasing our prices after almost 5 years, so we understand your misery, and we are grateful to know that you understand ours. But we can’t just do that without a big send-off party to our old prices. 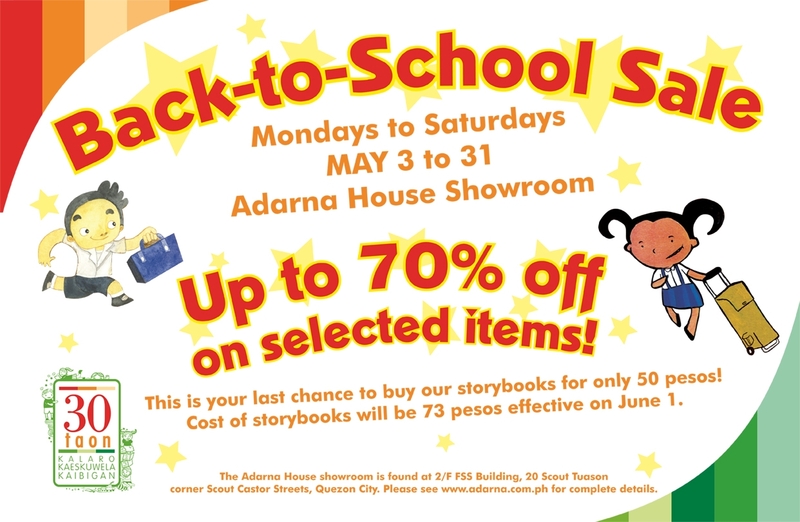 So please join us as we say a proud goodbye to our 65-peso storybooks with a month-long sale where they will be sold at only 50 pesos each. Selected items will also be on sale, for up to 70% off! Yehey! To avail of these huge discounts, come and visit us at our showroom (2/F FSS Building, 20 Scout Tuason corner Scout Castor Streets, Barangay Laging Handa, Quezon City) from 8:00 AM to 5:00 PM, Mondays through Saturdays, from May 3 to May 31. Comments Off on Back-to-School SALE! Maligayang araw ng mga Nanay!